Cher Horowitz wasn’t just the loveable main character in the classic comedy Clueless—she was also a tech genius. The blonde Beverly Hills teen figured out that the best way to manage her extensive wardrobe was a computer program that did the heavy lifting of cataloging clothing items and recommending outfits. A few apps have tried to update Cher’s virtual closet for the 21st century, but the newly relaunched iOS app Cloth may have just figured it out. You can sort through strangers' looks by city, weather, and occasion. 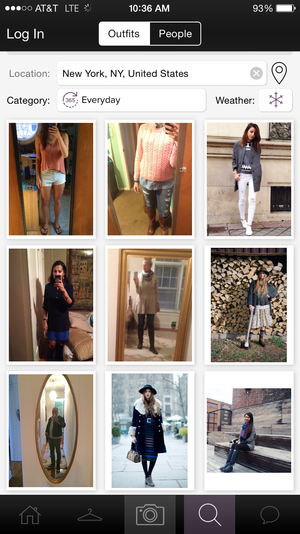 Cloth debuted two years ago as a way for people to photograph their clothes and put together outfits. Instead of cluttering up your Camera Roll with wardrobe shots, Cloth centralized your photos in one spot and let you tag outfits by occasion. All of those features are still around, but in its latest incarnation, Cloth is focusing on social. Call it the continued Instagramification of clothing: Now you can comb through stylish people’s photos around the world, filtering by clothing item, weather, or category (work, evening, vacation, etc.). In-app messaging lets you can share outfits with your friends and get their feedback. Cloth’s weather notifications got a boost from iOS 8 with interactive notifications that push out morning weather alerts and give you the option to see thumbnails of your best outfits for any temperature. Cloth has been testing its social features in other countries ahead of Wednesday’s launch. The app has racked up more than 2 million outfit submissions, so its style search isn’t a complete dud. You don’t even have to follow other Cloth users. Seeing the success of fashion bloggers on Instagram, the app’s team recruited well-known blogosphere personalities to be featured users in the Cloth’s main feed. Instead of seeing a stream of photos from people you follow, your introduction to Cloth is a series of curated, magazine-like images from super-stylish people. The app has sharing tools that let you post photos to social networks as well as publishing platforms like Wordpress and Blogger to appeal to busy bloggers. But even if you don’t post your outfits publicly, Cloth is still an intriguing social experiment, offering the ability to peer into strangers’ closets without all the “follows for follow” and “likes for likes” that plague Instagram—at least right now.